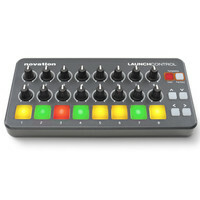 The Novation Launch Control can be used alongside the Novation Launchpad or as a standalone software controller to take performances to new levels of expression.Please note this item was returned unwanted from a customer. The original boxing is scuffed and all the seals are broken.Otherwise the unit itself looks and operates as new and has only been used a couple of times. This is a great opportunity to buy a fully functioning product at a discounted price supplied with a one year warranty.